On a friend's recommendation I gave Mastermind's newest a listen. 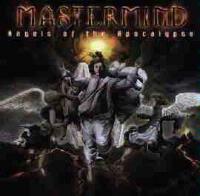 Though Mastermind is relatively new to my ears, I recognized familiar elements of prog metal - crunchy, waily guitars, throbbing bass guitar and pounding drum section and keys and vocals delivering rhythmic beats, amazing melodies and virtuoso compositions with cerebral themes. What sets Mastermind apart in my mind is the presence of mezzo-soprano vocals that add to, not subtract from the mood of the music. I found the lyrical content, compositional arrangement, and the band's virtuosity in the album to be impressive. A concept album of sorts, Angels is a Judeo-Christian flavored retelling of the End of the World taken from the Old Testament. Compared with past releases, Angels seems to be the heaviest to date. Considering the diversity of their body of work, it is difficult to say whether Angels is a good starting off point for those others new to the band's brand of prog metal. I can say this. if you like mezzo-soprano vocals you may want to give Mastermind's Angels of the Apocalypse a try. If you are more into instrumental music first timers may want to listen to last year's Excelsior. Mastermind's lineup at present includes Bill Berends (guitar, bass), Rich Berends (drums, percussion), Jens Johanssen (keyboards), and Lisa Bouchelle (vocals). Starting the story at the End, the tempestuous opener carries a grain of hope in the aftermath of Armageddon's wake "I pray that the light I shall seek, Lord grant me the strength and the wisdom, And the will to fulfil my own destiny". Fall down? Pick yourself up, brush yourself off and start over. The metaphor of sleep cloaks the underlying theme of mortality and desire to die in hopes of finding escape from existence in the next life. "I close my eyes and pray for sleep, Perchance to dream. of a quiet place of refuge". "2000 Years"'s groove offsets the lyrical subject- praying to a god who supposedly doesn't listen. This is a favored track on the album. People grow apart, but memories remain to salve the wounds of separation in this love song. Bouchelle's vocals are strong - strong enough to be smooth and still carry bitter grief to my ear, making me feel right along with her. A queen's quest for wisdom spurs her to dance for a wise man whom I assume to be King Solomon - the lyrics don't make it very clear. What the lyrics do say is that Her Highness is wise enough to know that riches aren't much in the face of knowledge. Bouchelle sings with authority and compassion as the biblical queen amid the instrumental section. The only instrumental track features the classical sounds of a harpsichord and acoustic guitar that calls to mind early Rush in parts. I love this song when feeling moody; it's dark in lyrical tone and inspires the same sort of head nodding of "2000 Years". However, it is a bit slower in tempo than its counterpart . Bouchelle sings duet with a cookie monster vocalist portraying the Beast- that combined with the switches in tempos make for an interesting sound. John Paoline's growly roar that ends the song is pretty scary with the right headphones. The only cover on the album, Mastermind's version is painted with different brushstrokes, but still is as vibrant as Emerson Lake and Palmer's 1972 original. The album ends with a bonus track, a song that seems to caution by example against obsessing with people you meet in dreams. It rocks but doesn't have a heavy or dark tone. It is very melodic.